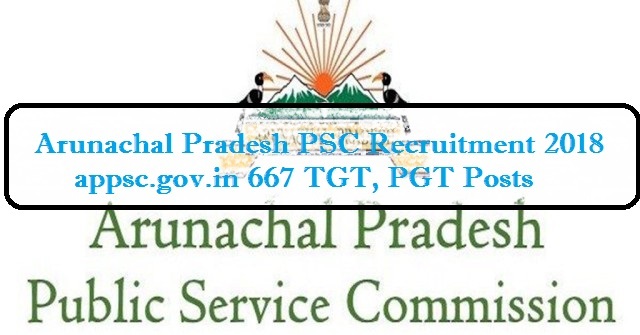 667 TGT, PGT Posts Notification in Arunachal Pradesh was published with the title of Arunachal Pradesh PSC Recruitment 2018. Refer that Teacher Posts Recruitment details in our page. Later from our page, go to www.appsc.gov.in to submit the Arunachal Pradesh Public Service Commission Teacher Application Form from 7th June 2018 to 9th July 2018. Most Prominent today employment news in Arunachal Pradesh State is this Arunachal Pradesh PSC TGT PGT Recruitment 2018 of 667 vacancies. Now only the full fledged notification that is supporting the latest APPSC Recruitment has been released. Teaching career wishing candidates across the state may prefer this Arunachal Pradesh PSC Recruitment 2018 to have a wonderful career ahead. But to experience that career you have to partake in these jobs selection process. For that involvement in the selection process, go to through this full post given in our recruitmentindia.in page. Arunachal Pradesh Public Service Commission has released Arunachal Pradesh PSC Recruitment 2018 notification for 667 Post Graduate Teacher(PGT) , Trained Graduate Teacher(TGT) vacancies. Application Form Last Date: 9th July 2018. Our page will be prioritized by many job searching candidates because we give the very fast updates regarding any employment news. Correspondingly we have updated this post about the very recent AP PSC Teacher Jobs Recruitment. Only with degree qualification, candidates may enroll the names in this Arunachal Pradesh PSC Teacher Recruitment 2018 process. If you want the confirmation with respect to the educational qualification of this recruitment, then underneath the table to catch a glimpse of the APPSC TGT PGT Notification. So by the vision of the details directly in the notification, the candidates will get the guarantee. More Recruitments of India are released now. Check them. The individuals who are flexible for this Arunachal Pradesh TGT PGT Vacancies 2018, then give a try to fulfill the job opportunity through this Arunachal Pradesh State Government Job. Before all the process like syllabus preparation, postulants have to view the AP Teacher Jobs requirements like educational qualifications, age limit, application fees, Arunachal Pradesh TGT PGT Salary details etc. These mentioned points are very crucial for any applicant before applying for this Arunachal Pradesh PSC Recruitment of 667 Posts. Don’t rush to fill the application form without referring the official notification. If notification checking is not possible, then at least look all the details given in this post. Our team cover up all the information of the full APPSC Teacher Recruitment Notification. Here that information is addressed as sub-topics with clear sub headings. Seek out all those details but these stages of recruitment details verification and application form submission should be finished by the last date i.e. 9th July 2018. 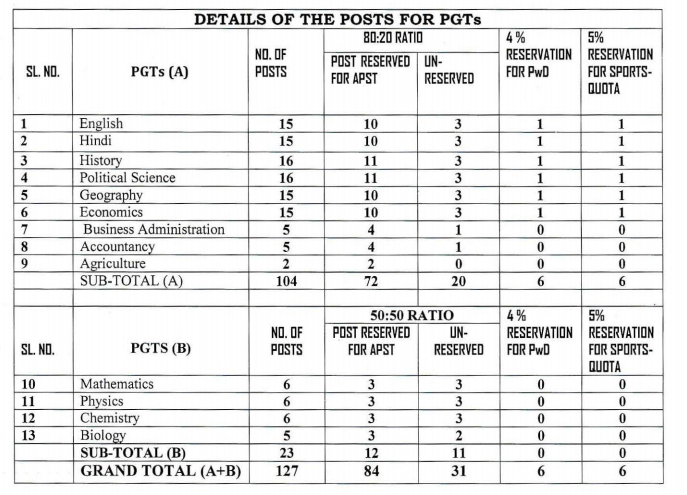 Remember the date so according to that date, make the forward steps to attend the Arunachal Pradesh TGT PGT Selection Process.If your conclusion after notification checking is to participate in this AP PSC 667 PGT TGT Posts Recruitment, then know the Arunchal Pradesh TGT PGT syllabus to start preparing from today itself. So that syllabus also published at our page only so don’t waste your time for this syllabus searching. Step by Step Procedure to fill the application Form of Arunachal Pradesh Public Service Commission Teacher Recruitment 2018? Under this icon, Advertisement for the post of PGT & TGT is given. Download that notification, know the details. If you are the eligible candidates, then fill the application form. 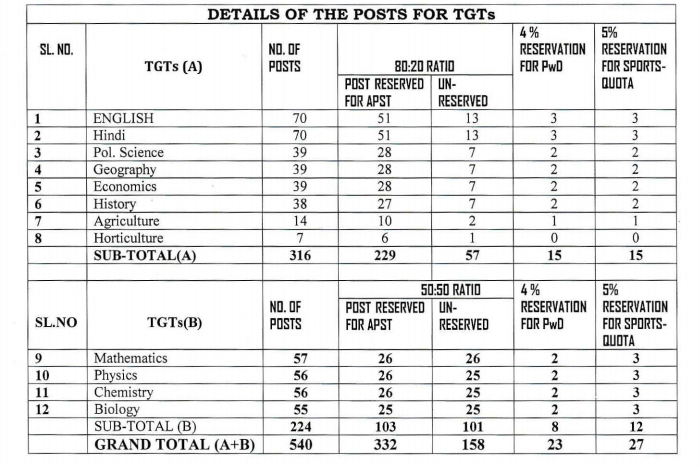 Apply Online for 667 TGT, PGT Posts in Arunachal Pradesh @www.appsc.gov.in. The active links of the application form are possible to view only from 7th June to 9th July 2018. Know the applicable criteria for this recruitment, in case you are the pertinent person according to the Arunachal Pradesh PSC Recruitment 2018 conditions, the move forward for the application submission. Don’t postpone the Arunachal Pradesh Post Graduate Teacher, Trained Graduate Teacher Application process once if you are the willing candidates a. Exclusively online mode of applications only will be welcomed by the APPSC board. So never post your application form through regular post. Primarily we are stating that Degree and Master Graduates are the educational wise eligible candidates for this Arunachal Pradesh Public Service Commission Teacher(TGT PGT) Recruitment 2018. Use the previous papers also uploaded by us.